Dramatica will improve your story or your money back! just let us know and we'll promptly refund your purchase price! Dramatica is the only story development software with a patented interactive story engine that cross-references your dramatic choices to ensure a sound structure. Dramatica has been employed on top-grossing motion pictures, award-winning television productions and best-selling novels with combined box office and sales of billions of dollars. Dramatica is ALSO the only story development software to receive four stars from Writer's Digest magazine, and is praised by Wired magazine, CNN and many other publications. The heart of Dramatica software is its patented story engine that keeps track of every choice you make for your story, cross references their collective dramatic impact and alerts you to any holes or inconsistencies in your structure. Your story will be solid every step of the way through development. Dramatica's story engine not only points our holes and inconsistencies, but also provides suggestions for the best kinds of topics and story points to fill and fix them. You'll always know what to do to solve your story problems. Dramatica's Build Characters tool enables you to select from a palate of traits and elements and assemble them into structurally sound characters who have a real purpose in your story. You can built anything from archetypes to complex characters to single-purpose characters and stereotypes. You'll always know who your characters are and why they are there. Dramatica gives your plot a complete timeline, marked out in signposts (key junctures) and journeys (the path by which those junctures are reached. In the Plot Progression area, you'll see how your characters' arcs interact with the flow of your plot so each drives, affects and is affected by the other, integrating the human and logistic aspects of your story. You'll always know what happens in Act 2! Dramatica's Brainstorming section will help you choose a structure from over 30,000 available! You can then tailor each to your particular story with Dramatica ensuring you maintain a solid structure. Dramatica will suggest characters for your story, with slider controls to determine the balance of traits and attributes. Get Step by Step guidance with the StoryGuide, which takes you point by point through the entire development process. Every story point provides examples from well-known novels, stage plays and movies that share your dramatics. Build your story chapter by chapter or scene by scene with built-in templates for novels and screenplays. Theme Browser Choose your thematic topics and see how they will affect your characters and plot. Dramatica doesn't write your story for you, but cross-references your dramatic choices to ensure a sound structure before your write. With Dramatica's help, you'll know if a problem is caused by what you are saying or how you are saying it. You'll know which characters will be changed by their experiences and specifically in which ways. You'll know with absolute certainty "what happens in act 2" and the precise order of events. You'll develop a theme that is shaded and toned, rather than ham-handed and simplistic. Can a software tool really improve your story's structure? There's only one way to find out. Try Dramatica risk-free for 90 days. 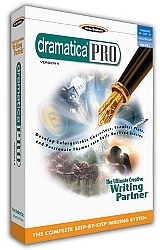 We're confident you will find Dramatica to be the key to perfect story structure. But if it doesn't work well with your personal writing style, just let us know and we'll promptly refund your original purchase price. Copyright The Storymind Store. All Rights Reserved. eCommerce Software by 3dcart.